Safe... it doesn't have to mean slower. Liquids, gels, and aerosols are permitted in 3 ounce containers, placed in 1 quart size, clear plastic, zip-top bag. One bag per traveler. Remove all items from pockets and any accessories, including wallets, belts, money and keys, before going through screening. Removing these items will reduce the need for additional screening. To avoid leaving any personal items behind, place them in carry-on-bags prior to entering the checkpoint. If carrying a firearm, please check with your airline for appropriate procedures. Show your government-issued ID and boarding pass to the security officer at the checkpoint. 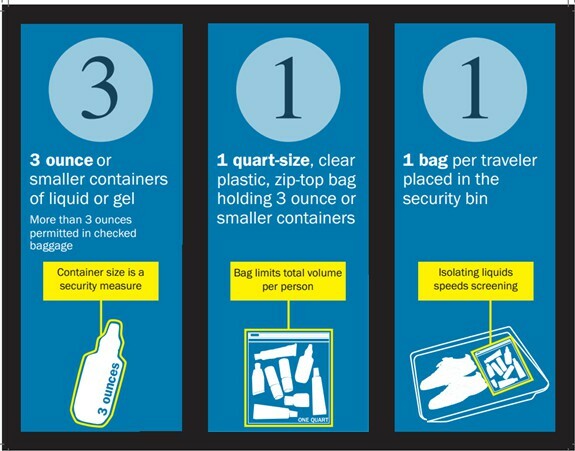 Take your 3-1-1 bag out of your carry-on and place separately in the bin. Declare all medically necessary liquids to a security officer at the checkpoint. Take laptops and other large electronics out of their cases and place in a separate bin for X-ray screening. Remove footwear and place in a bin. Wearing footwear that can be easily removed helps speed the process. Please also remove jackets and sweaters and place in a bin.